This latest edition includes a full revision and expansion, including maps on each of the profiles and additional color charts. When God prepares a major advance of His purpose, He often sets His people praying first (so the glory will be clearly His). birthed the first concerted Protestant mission efforts. Today God is stirring prayer anew for the completion of His unchanging purpose! Unreached people groups with a significant presence of Christians (.1% to 5%) or Evangelicals (up to 2%). now dubbed Frontier People Groups. in other people groups the Holy Spirit can work through the renewal and equipping of existing Christians to release such a movement of God’s blessing. One fourth of the world’s population live in these Frontier People Groups, with less than one Christian family (of any kind) per 1,000 families. Half the population of these Frontier People Groups live in just 31 people groups, each with a population over ten million. Prayer Leaders suggested developing a tool to guide the global body of Christ in praying for these 31 Frontier People Groups. God gave unusual unity to a diverse group of leaders in pulling this prayer guide together. This prayer guide was ready for the first printing just 40 days later after it was suggested! Throughout God’s Word, He declares and demonstrates His intention to bless all the families, households, clans, tribes and peoples of the world (not just individuals). Yet the hyper-individualism entwined with Western Christianity has often hindered God’s blessing from flowing through whole communities by winning individuals away from their families. In many cultures the resulting division of a family and shame on the extended family is perceived as a sign of God’s curse. God sometimes honor the faith of those who follow Jesus even at the cost of their family relationships by gradually healing the rift in their own families, but in the meantime other families in the same community become determined not to let their families become similarly divided. Thus the approach of winning individual families bears some fruit, but far less than when God’s blessing flows from family to family, healing and strengthening families. Since the late 1990s, the Holy Spirit has demonstrated anew His eagerness to bless peoples, families and other pre-existing relationships and societal structures through movements of rapidly reproducing churches, toward the good news of God’s kingdom finally being preached in all the world, as a testimony to all peoples (Mt. 24:14). Over the past two decades, the number of such movements has increased rapidly (from a handful in 1995 to more than 650 such movements today), now with more than 50 million disciples. And most of these movements are doubling in size every two to five years (see the short article Astonishing Progress. Many factors could slow this trend, however the large network of movement leaders represented by the global 24:14 Coalition is working aggressively to continue and accelerate the multiplication of such movements with the aim of movements in every remaining unreached people and place by 2025. Ask me, and I will make the nations your inheritance …. Will you join this prayer movement? Frontier People Groups often perceive Christianity as a foreign influence, threatening to tear apart their families and communities. Within such Frontier People Groups, traditional church planting through witness to individuals generally reinforces these fears. The 31 largest Frontier People Groups in this prayer guide, plus another 370 that are over 500,000 in population, carry great influence with many smaller FPGs, making it doubly urgent and strategic to pray for Jesus movements blessing families among these 400 large and influential FPGs. Prayer is the essential foundation for any movement. 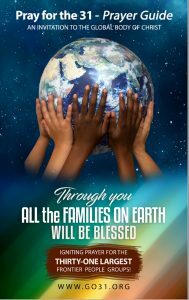 This booklet empowers you to play a vital role in the fulfillment of God’s promise to bless all the families of the earth! One fourth of the world live in slightly less than 5,000 “Frontier People Groups,” where Christian families of any kind number less than one in 1,000. Satan’s hold over these Frontier People Groups is magnified by their fear of Christianity as an invading threat to their families and communities. About half the population of these Frontier People Groups (about one eighth of the world’s population) live in just 31 of these groups, each with a population above 10 million. Prayer—the focus of this booklet—is the first step toward freeing the precious families in these Frontier People Groups from Satan’s grasp, to receive God’s blessing through Jesus. Traditional church planting (through evangelism of individuals without regard for their families) reinforces the fears of these Frontier People Groups, and delays God’s stated intention to bless all the families of the earth (Gen 12). Jesus Movements that heal and bless whole families are the only way such peoples have historically come to widely experience God’s blessing in more than small numbers. Our common Christian/mission language of “reaching” peoples heightens the fear among Frontier People Groups of Christianity as an invading, foreign influence; the prayers in this booklet thus focus believers on praying for God’s blessing on families through movements. The term “church planting movements” uses overlapping terminology with “church planting,” and fuels the common but wrong assumption that evangelism of individuals toward planting a new congregation is a step toward a movement. In fact, such evangelism and church planting creates unnecessary barriers to movements. The phrase “kingdom movements” can alarm governments that fear competition from other kingdoms (consider India’s recent revocation of 10,000 licenses of foreign ministries to India). Introduces the 24:14 Coalition as a major vehicle for Jesus movements among every people. 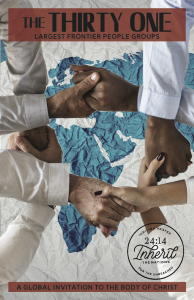 Introduces the 24:14 Inherit The Nations initiative to pair prayer teams with field teams. Offers free copies of Hastening and Stubborn Perseverance to fuel understanding of how movements bless families and people groups and how God is reaping an unprecedented global harvest through movements. Among unreached groups with an existing Christian presence, a seed is already present through which renewal and equipping can lead to God’s blessing flowing through families and other pre-existing relationships. However Frontier People Groups still await this first planting of an indigenous faith community from which God’s blessing can rapidly multiply.